Today, I am happy to say, the dogs are still pretty tired from camping. Yay! 🙂 Though they did play some when I got home, they are mostly still sleepy and resting a lot. And Levi isn’t even complaining about being on the couch, which is, actually, quite odd. 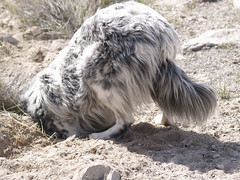 This is a cute picture of Muffit checking out the hole that Chase was digging. Chase must have really loved digging for the gophers down in Richfield when we were visiting! When we went down there I didn’t get us any travel health insurance, but we didn’t really need any. And Lucy did great camping, too. She is getting a bit old, and a bit slower… she is 9 now, but she had a good time. She often found shady spots. But she did run around with the younger dogs a bit, too. I am sad that she is getting older… I keep telling her she is not allowed to get any older, but dangit, it’s not working. 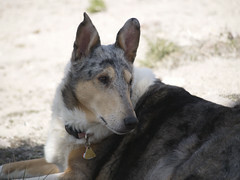 I love my Lucy girl, she is the oldest of the pack now. She is our cornerstone. We will be taking her back to the vet later this month for another xray, to see if she really does have cancer or not. We sure hope not. Aw, I sure hope Lucy is OK. I’m glad you and all the dogs had a great time camping.